Femoroacetabular impingement (FAI) is a condition where the hip bones are abnormally shaped and the ball (femur or thighbone head) and socket (acetabulum) joint of the hip bones rub against each other due to abnormal contact. Bone spurs form around the femoral head and/or acetabulum preventing smooth gliding movement of these bones against each other. This condition can damage the articular cartilage (smooth cushioning surface of the ball and socket) or cause a tear in the labrum (soft elastic tissue which forms the socket ring) in the hip joint. 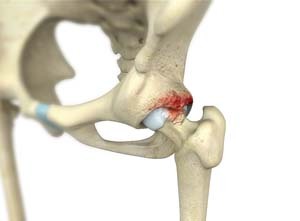 The progression of this injury to the tissues in the hip joint can result in degenerative joint disease and arthritis. Your doctor will make an incision of about 6 to 10 inches and cut the upper thighbone to dislocate the femoral head from the socket so that all the parts of the hip joint can be exposed. The complete dislocation allows repair of the labrum tears and bony abnormalities of the femoral head and allows intraoperative protection of the blood supply to the hip.